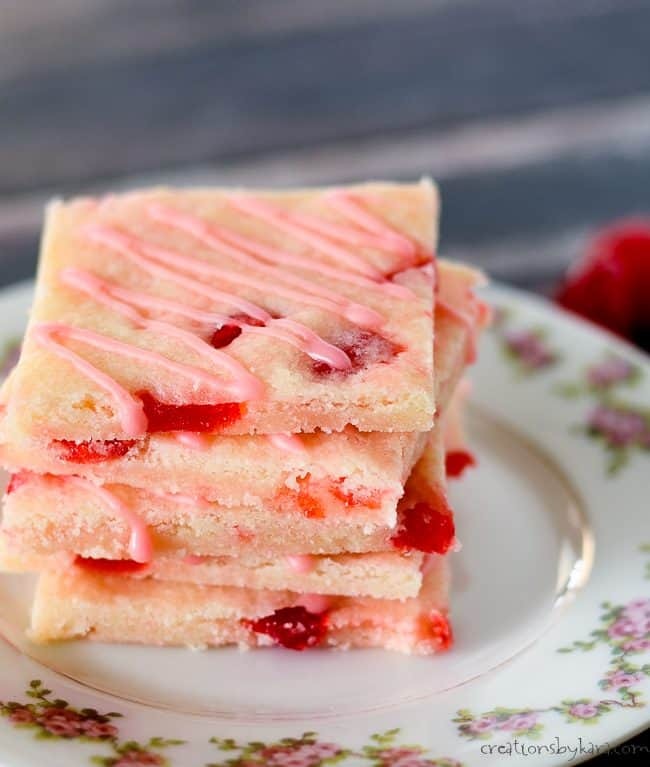 This recipe for Maraschino Bars is so simple, but so tasty. They are loaded with juicy cherries, and the cherry glaze makes them simply irresistible! Here is another recipe that made it onto my Christmas plates of goodies this year. 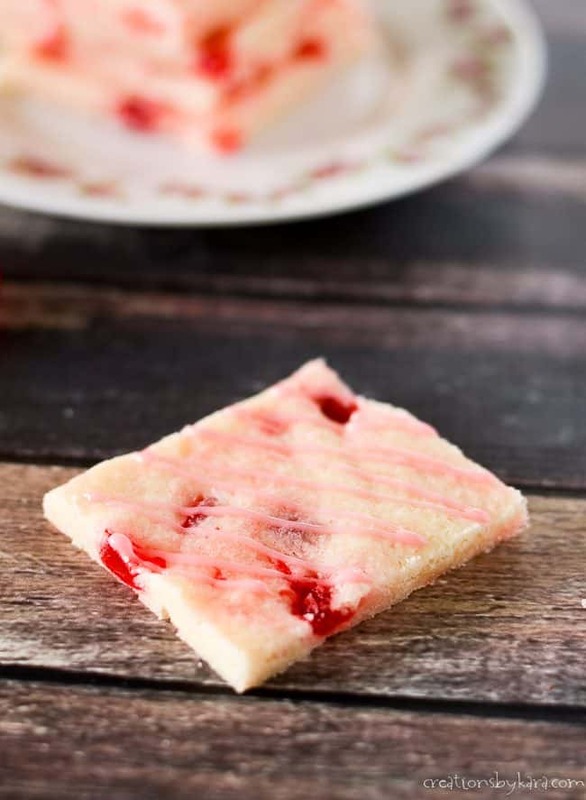 I love these cherry bars because not only are they super easy to make, but they add a great splash of color to cookie trays. And I am a fan of just about anything with almond extract in it! These bars are an adaptation on my Jan Hagel cookies. My mom and I did some experimenting when I was in high school and added cherries instead of cinnamon sugar. After making a test batch, we decided they would be even better with a bit of glaze. Maraschino cherry bars were born! Aren’t they just so pretty with those bits of juicy cherries peeking out? They are perfect for Christmas, Valentine’s Day, and even bridal and baby showers. 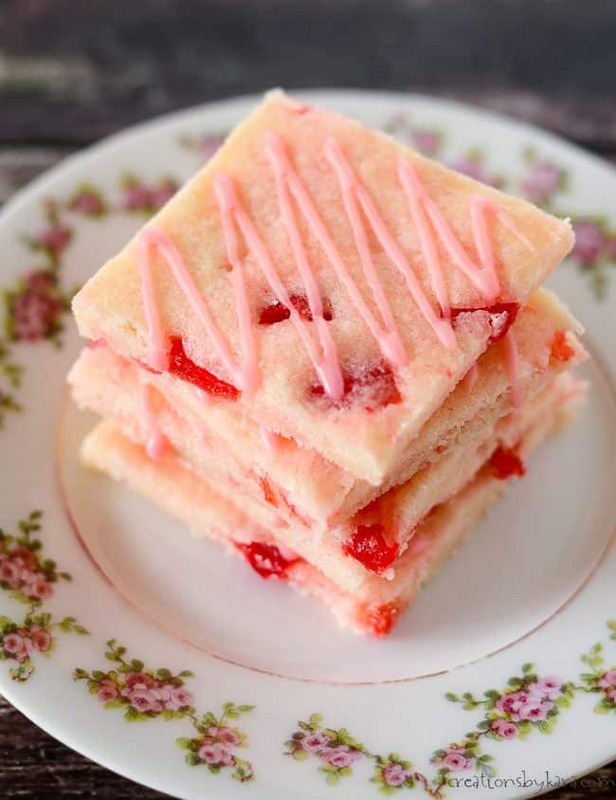 How to you make maraschino cherry bars? You won’t believe how easy these are to make! They are actually a great recipe for beginning bakers, because you can’t really mess them up. I like to start by chopping up all my cherries, then setting them aside. Next you cream your butter and sugar. Beat in the egg, vanilla, and almond extract. Then just stir in the flour, salt, and chopped cherries. After the dough chills for a little bit, you press it into a large cookie sheet with sides. This is actually the most difficult step. I like to wet my hands down occasionally so the dough doesn’t stick to them. Bake the bars at 350° for about 15 minutes. After they cool, you drizzle them with a simple glaze. Do I have to use almond extract in my cherry bars? Of course I cannot force you to use almond extract, but it makes a HUGE difference in the flavor of the bars. You can leave it out or use extra vanilla, but they will not be the same. If you’re worried about nut allergies, use imitation almond extract, or make your own almond extract in a pressure cooker. Chewy, buttery, and perfectly sweet, these cherry bars are hard to stop eating! 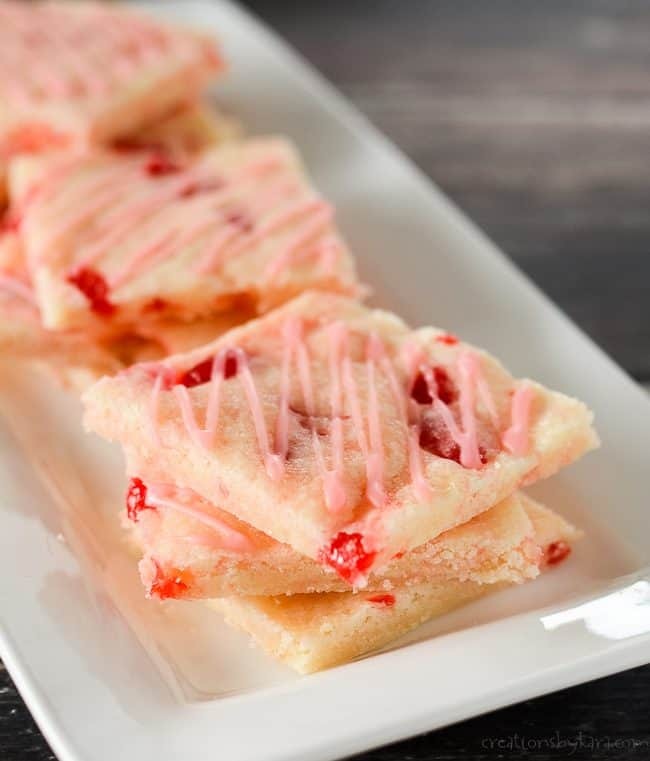 Soft buttery bars filled with juicy maraschino cherries, and drizzled with cherry glaze. Cream sugar and butter in a mixing bowl till smooth and creamy. Beat in egg, vanilla, and almond extract. Stir in flour and salt, then cherries. Chill for at least 30 minutes or until no longer sticky. Pat dough into a lightly greased 15" x 10" jelly roll pan. I periodically dip my hands in water so the dough doesn't stick to them. Bake at 350 for 15-18 minutes. Cool completely and drizzle with glaze. To make glaze, combine powdered sugar and enough cherry juice till you get the right consistency. Make sure you chill the dough at least a little bit, or you will make a sticky mess trying to spread it in the pan. So pretty! It’s funny how I really don’t like maraschino cherries on their own but in a recipe like this, they are delicious. I am actually the same. I never eat the cherry on top of an ice cream sundae, but I love them in baked goods! These look so delicious! Love that glaze on top! These are the sweetest treats ever! So pretty! These look so good! Perfect way to balance out our chocolate overload! 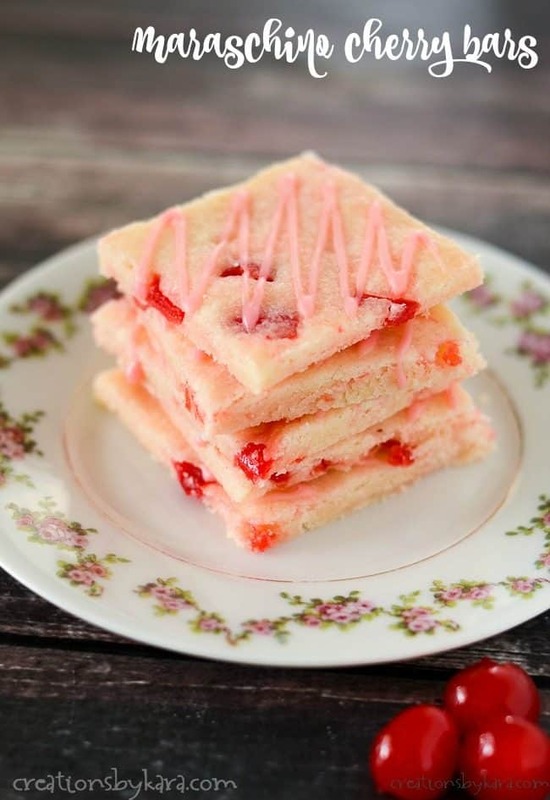 These look fabulous, am linking them up with my cherry donut recipe on Monday! I made these for all my boys and husband’s home teaching families tonight. They were yummy. Actually my boys made them, I just drizzled them when they were done. Those bars look so delicious! I do have a question about the almond extract. I allergic to almonds, but was hoping to make these bars (or other desserts) with vanilla extract instead. I don’t think they sell imitation almond extract either. Would using vanilla extract (imitation or pure) be a problem other than changing the taste? You can substitute vanilla extract for almond in just about any baked good. However, almond extract has a much more pronounced flavor, so using vanilla will result in a more bland flavor. 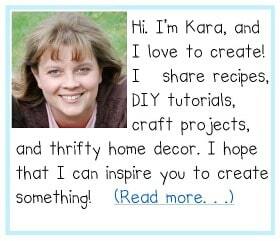 Delicious Kara!! And thanks for the plate of goodies! I’m so lucky to be your neighbor! Love these! The pink is so fun!